My darling hubby, Steve was diagnosed with diabetes 6 years ago. It's hard to believe it has been 6 years! It was a shock to us, but when we really started thinking about our diet, it was easy to see why. Steve had this habit of eating one meal a day, and that meal would be huge to make up for not eating the rest of the day. This reeked havoc on his blood sugar without him ever knowing. Once the diagnosis was made, and we attended nutrition classes, we really got on the ball and stuck to a diet that not only helped him lose weight, but also lower his blood sugar. It took a couple of years for this to happen, but it did happen. 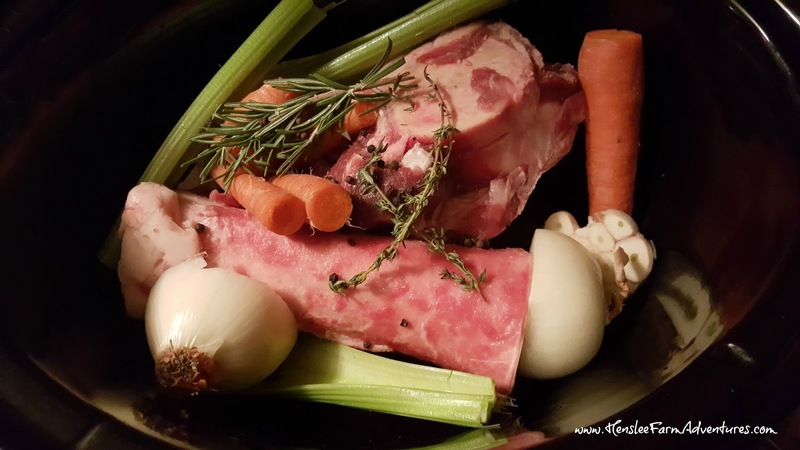 The beginning of a beautiful bone broth. Nature's elixir of youth. I was bound and determined to be as supportive as I could so I decided to follow his diet as well, only tailor it to female proportions. In doing so, I lost 45 pounds over a year's time. I was able to keep the weight off, until the past year and a half. Beautiful purple potatoes, high in antioxidants, they can help lower blood pressure and strengthen the immune system. It is so easy to ease back into bad habits. Life can get pretty hectic, and during the winter, when we don't have the fresh veggies coming out of our garden to eat, we end up taking advantage of fast foods and convenience foods. But once we start eating those, the pounds pack back on. And Steve's blood sugar starts creeping up (he had lowered it with diet and exercise), and his cholesterol started to rise. Here's the kicker. It isn't just our health that is of concern, but it is our children as well. We can tell our kids all we want not to drink soda or eat junk food, but if they see mom and dad throwing back a can of soda and a bag of chips, then what does that tell them? I love this quote. It says so much about our society. So in order to get us back on track and teach our kids good nutrition, we have started eating healthier. I won't say we are on a diet. In fact I absolutely hate that word and how people have used it in a negative way. Really there is nothing wrong with the word. The actual definition from Merriam Webster is "food and drink regularly provided and consumed" and the next one is "habitual nourishment." I kind of like that last one. It is not until the fourth definition provided that it talks about diet being a way to lose weight. I have already shared a couple of recipes with you that would fall into the almost healthy range. I say almost healthy because they could do with a little tweaking to make them even better. One of them is Lentil Sloppy Joes. 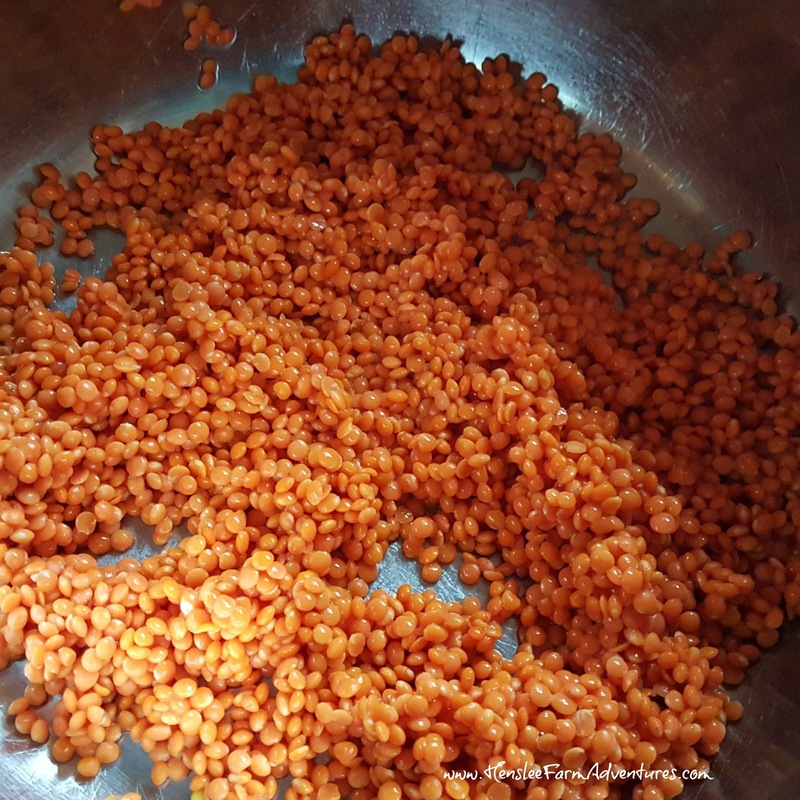 We made these again last night, but I used red split lentils instead of the green lentils. Isn't the color gorgeous! They are a great source of fiber and protein and are also packed with B vitamins and iron. I also cut way down on the amount of sugar. Instead of the 1/2 of cup that the recipe calls for, I used 1/4 of a cup. The rest of the recipe stays the same, but this time, I added some fresh mushrooms and diced tomatoes to the sauce. It was yummy! In fact Carly loved it so much that she took the leftovers to school with her for her lunch. Now I call that a win! 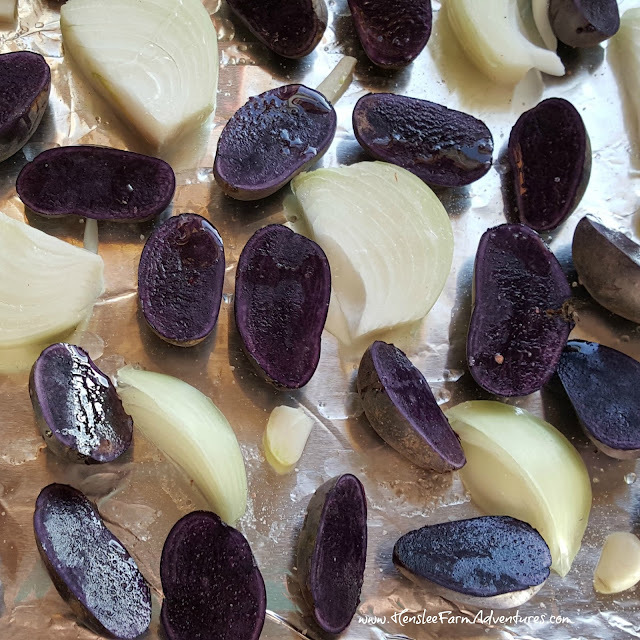 We are trying to eat foods with an abundance of color (like the purple potatoes pictured above). We also have cut down on our snacks, unless they are healthy (like yellow, orange, white, and purple carrots!) and we have cut down on our portions. 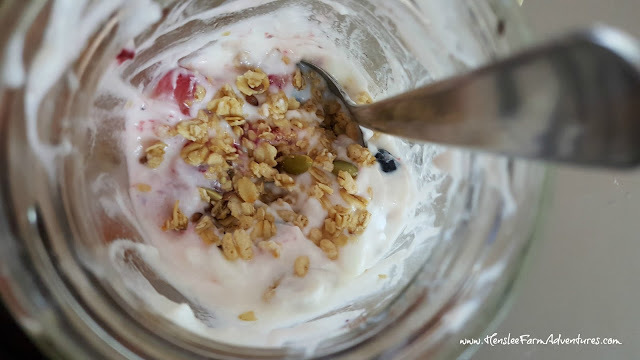 One of my favorite breakfasts, plain organic yogurt with frozen fruit and pumpkin flax granola. The other thing that we are changing is purchasing organic. Not only is it healthier for you, but the food really does taste better. Think you can't afford organic? Then you need to revisit the stores. The organic versions are only a few dimes higher than the non-organic. Some of them are even the same or less if they are on sale! Another way to get inexpensive organic veggies is to grow them yourself. You don't need a big plot of land, you can plant seeds in flower pots. Don't want to grow them yourself? Another great place to get organic produce is at your local farmer's market. My organic and non-GMO groceries from Aldi! So from here on, you will be seeing healthier recipes from me. And with the garden season starting, it will (hopefully) be with veggies that we grow ourselves. I hope that you will stick with me through this and that you will make baby steps as we are in striving to eat healthy!